In line with our goal of helping you achieve your most beautiful skin, we’ve put in a lot of hard work to find the best retinol creams for acne prone skin through 25 different products. Our top choices were selected based on their effects, formulation and additional contents. Obagi 360 Ret﻿﻿inol 0.5 Technology is the priciest one on our list. It also contains the least amount of product. It contains time-released retinol that gets dispensed on your skin for several hours. In just a matter of 4 weeks, RoC Retin﻿ol Correxion Deep Wrinkle Night Cream promises to improve your fine lines and skin texture. It works well in improving dark under eye circles, too. 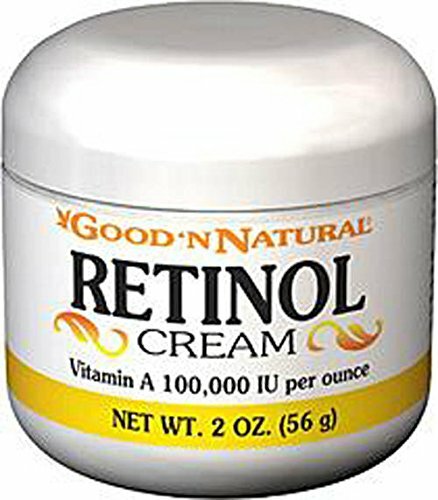 Good N Natural Retinol Cream contains a good amount of vitamin A at 100,000 IU. It's a must-use product if you have dark spots, skin breakouts and big pores. Take note that this product has a thick consistency. Advanced Clinicals Retinol Cream contains no paraben. Although creamy in texture, it isn't oily when applied to the skin. Among the products listed here, this one offers the highest quantity at 16 oz. We like that it comes with a pump for easier dispensing. If you detest the greasy and sticky feeling that come with most retinol creams, LilyAna Naturals Retinol Cream Moisturizer is a great product for you. It contains not just retinol, but hyaluronic acid, green tea and jojoba oil. Not sure about which is the best retinol creams for acne prone skin? Allow us to break down the details for you. Obagi 360 Retinol 0.5 Technology cream is a very potent product. Its high-strength formulation is designed to reduce your fine lines, wrinkles and uneven skin texture with minimal irritation. It dries out pimples and helps breakouts heal quicker. It can come with mild peeling but not as extreme as you’d expect. The product comes in an airtight pump container. You won’t need to press the tube to dispense the product. As for the price, this one is the most expensive one on our list. It also contains the least amount of product at 1 oz.Obagi 360 Retinol 0.5 Technology cream is a good retinol cream to start with if you are still new to this type of product. If you are looking for a stronger retinol cream, you can try its 1.0 Technology version. 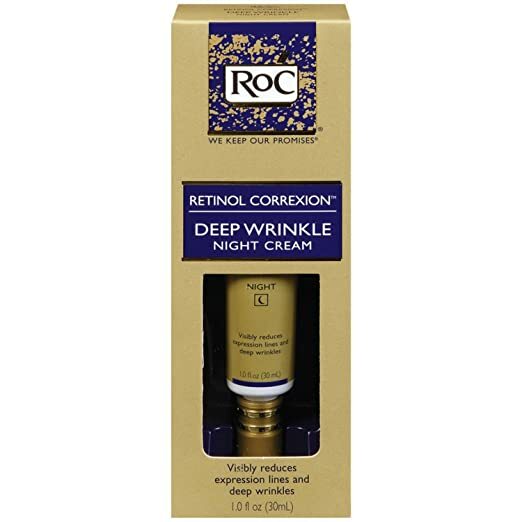 RoC Retinol Correxion Deep Wrinkle Night Cream is one of our best over the counter retinol creams for acne since its oil-free and noncomedogenic. The product promises to give you smoother skin in just 4 weeks by reducing your expression lines. After 12 weeks, it claims that it can get rid of your deep and fine lines. A lot of its users are actually long-time fans of the product. And they can attest how the cream made their skin youthful looking throughout the years. Some of them even noticed a great improvement in the appearance of their dark undereye circles. This product has a creamy texture but it’s lightweight. It works well under moisturizers. RoC claims to use pure RoC Retinol in this product. However, it doesn’t really clearly state how much retinol the product really has. When using the product, you should anticipate experiencing mild tingling sensation. It’ll fade after a while and as your skin gets desensitized to it. The cream is meant for nighttime use. But, as a word of caution, make sure that you use a quality sunblock over it to avoid photosensitivity reactions if you’re going to use it during the day. Good N Natural Retinol Cream is packed with 100,000 IU of vitamin A per ounce. It contains a generous amount with 2.0 oz of product. Aside from vitamin A, it also has vitamin E which is considered a powerful antioxidant. It comes in a compact container with a twist lid. Its size is convenient both for traveling and storage. The product has a thick formulation which some users were not really fond of. However, when it comes to effects, this retinol cream works well, particularly in reversing dark spots, large pores and skin breakouts. It doesn’t leave any greasy feeling despite its consistency. It gets absorbed well, too. In fact, it goes smoothly under makeup in case you decide to wear it during daytime. One thing that might discourage you from using this product is its scent. It can also trigger skin breakouts due to its coconut oil content. 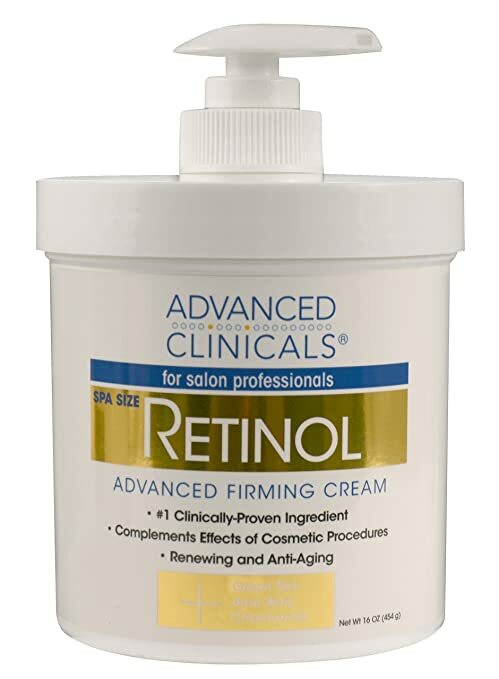 Advanced Clinicals Retinol Cream is most commonly used by professionals. It’s packaged in a 16 oz jar with a pump. We particularly liked that it comes with a pump. It’s more hygienic and does a better job at preserving the product. The less it’s exposed to air, the better right? This retinol cream is free from paraben which is something you’ll be able to safely use on your acne prone skin. It is gentle and hydrating enough even for dry skin. The product is infused with natural ingredients on top of its vitamin A content to make sure your skin stays safe from the drying effects of the vitamin. It has green tea extract, chamomile and aloe vera. It’s creamy but not oily. It goes on smoothly on the skin and leaves it feeling fresh. The price may be a bit higher than other retinol creams. However, since you’ll be getting 16 oz of product for its price, we feel that this is a good steal. Take note, however, that the product doesn’t specify how much vitamin A it has. Containing hyaluronic acid, green tea, shea butter and loads of other ingredients your skin will surely fall in love with, LilyAna Naturals Retinol Cream Moisturizer can address uneven skin tone as well as bring back your skin’s natural glow. This one isn’t sticky and doesn’t leave any greasy feeling. It won’t clog pores which means that those who have acne-prone skin can use this one without much issues. The cream is so gentle that you can use it on your undereye areas as well as the skin on your neck and skin. One issue you may have with this product is its scent. Although it claims to be fragrance-free, it still has this subtle smell. It is, however, not that bothering. The product is a bit thick, but it’s not that difficult to spread. In fact, it instantly gets absorbed by the skin. The use of retinol creams isn’t a new thing. The product is actually a staple in most women’s skin care routine, particularly those who want to slow down the signs of skin aging. As we age, our body’s natural processes tend to slow down. This includes your skin’s turnover rate. The slower your cellular turnover, the slower your dead skin cells can be replaced. This translates to dry and dull looking skin. Applying retinol cream can help ensure that the top layer of your skin stays healthy and radiant. Your body naturally produces collagen which makes your skin supple and elastic. Collagen helps strengthen your skin’s structure so that it becomes more resistant to damage. However, with age and stress, your body becomes less and less capable of producing collagen. This results in wrinkles and saggy skin. Aside from its ability to boost your skin’s structure, retinol creams can also help get rid of the debris on your skin. They can also help unclog your pores and reduce your skin’s excessive oil production. Retinol creams have tons of benefits for the skin. If you’re still not using it as part of your daily routine for your skin, you’re missing out a lot. Basically, having the best product isn’t a complete guarantee that it’ll work for you. You also need to know how to apply it properly. Don’t apply retinol creams immediately after washing your face. Wait for a couple of minutes to let your skin rest first. Wear sunscreen on top of your retinol cream if you are using it during the day. To avoid photosensitivity reactions and burning, you can choose a retinol night cream. Start slowly with retinol creams particularly if you’re new to using the product. If you experience irritation, decrease the amount you use or your frequency of application. Avoid mixing it with acne treatments containing salicylic acid and alpha hydroxy acid to avoid adverse reactions. If you’ll be waxing your facial hair, make sure that you skip your retinol creams at least a week prior to waxing. Retinol creams are a great help when it comes to skin aging issues and breakouts. For this roundup, we’re selecting Obagi 360 Retinol 0.5 Technology cream as the best retinol cream for acne prone skin. Containing time released retinol, this product ensures continuous benefits to your skin.